Where Are Recent Grads in the First Months out of Wellesley? As the end of summer appears over the horizon, and campus is stirring with preparations for the 2013-14 academic year, we visit again with the recent graduates of the green class of 2013. Each year Wellesley’s Office of Institutional Research conducts a survey of graduating seniors to learn of their next steps, and longer-range plans, as well as some of their views of their just completed education. According to the survey, 65 percent of graduating seniors planned to work full-time in the fall and another 11 percent planned to work part-time. Eighteen percent were entering full- or part-time graduate/professional programs: Of those, 55 percent were in pursuit of master’s, 15 percent doctoral, 13 percent medical, and 5 percent legal degrees. Fifty-five percent of the students who had begun a job search before graduation had at least one offer by the end of May. This is above the national average of 44 percent reported by the National Association of Colleges and Employers (NACE). Follow-up surveys typically reveal employment figures for recent grads going up by the end of the summer. For example, after working as a senior summer intern for the Wellesley Admission Office, Malia Maier, a peace and justice studies and Spanish major, is working this fall with an AmeriCorps program in East Boston called Let's Get Movin’. Run through the East Boston Neighborhood Health Center, it is a lifestyle-change program for children and teens that promotes physical activity, teaches proper nutrition, and helps young people make healthier lifestyle choices. “All of the kids in the program are referred by doctors for being overweight or obese, so you could also call it an obesity prevention initiative,” explains Maier, whose years as a Wellesley basketball player will come in handy in keeping kids movin’. Anoush Youssoufian will also remain in Wellesley’s backyard for her first job. The economics major and biology minor will be working for Policy Analysis, Inc., a health economics consulting firm in Brookline, Mass. "I am so grateful for all that I have learned over the past four years at Wellesley,” she told us. “I owe my confidence and preparation for what the future holds to my professors, peers, friends, and family. Though the progression from college to career initially appeared daunting, it ultimately proved to be a seamless transition." The biggest employer for the class of 2013 was Teach for America, which hired at least 10 graduating seniors. Teach for America has either been the top employer or tied for top employer of Wellesley grads for nine of the last 10 years. Other top employers include the Massachusetts General Hospital and the Dana-Farber Cancer Institute, JET Program, Analysis Group, and Bank of America. While teaching and research positions—either in laboratories or consultancies—seem to dominate the list of first jobs, the range of endeavor of survey respondents is impressive, from production assistant at E! Entertainment to software engineer for The Boeing Company, from nanny/graduate student to legal assistant in a law firm. Countries outside the United States in which Wellesley’s newest alums will be working include Canada, China, Dominican Republic, France, India, Indonesia, Japan, Mexico, South Africa, the United Arab Emirates, and the United Kingdom. Seventy-eight percent of job holders and 83 percent of those seeking higher degrees are continuing in areas related to their undergraduate work, and the majority felt prepared for this next stage. Annick Mansfield, research analyst in the Office of Institutional Research, noted that many of these first jobs are transitional positions, and “few of these show up in alumnae surveys five years out.” Indeed, the survey shows that most of those who planned to work anticipated eventually obtaining graduate degrees. Of those hoping to go to graduate school straight from Wellesley, 92 percent had been accepted into a program, 73 percent by their first choice school. 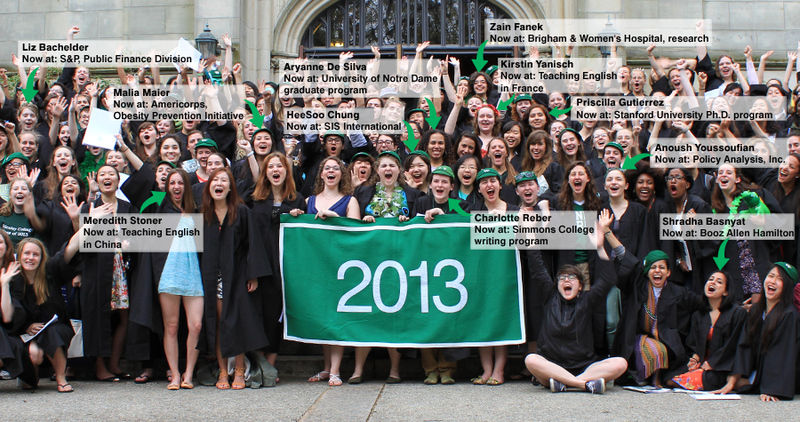 Among the many internships and fellowships received by Class of 2013 graduates, we note a few. Fulbright Scholarships went to Carolyn Bonner Campbell ’13, who will intern with a company in Mexico and enroll in graduate courses at the Instituto Tecnológico Autónomo de México in Mexico City; Rebecca Danielle McClain ’13, whose Fulbright takes her to Germany and work on nanotechnology; Rebecca Ruhl ’13, who will teach English in Russia; and Christina Moriah Smith ’13, who will teach English in Brazil. Alice Choe ’13 received the prestigious Thomas J. Watson Fellowship for 2013-14. The fellowship supports Choe’s research on domestic violence, which will take her to Jordan, India, East Timor, and Thailand. Lucy Yichu Liu ’13, the 2012-2013 Katharine Malone Scholar, will begin at Yale University Medical School in the fall. * The photo labels’ font is small! Here’s who’s identified in the picture, left to right. These individuals may or may not have participated in the official survey. Now at: Policy Analysis, Inc., a health economics consulting firm in Brookline, Mass. Now at: Booz Allen Hamilton in Washington, D.C.